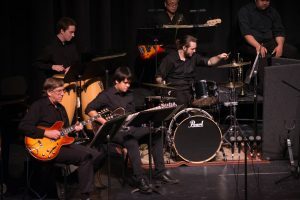 Looking back, I see I’ve posted a bit about the Skyline College Jazz Band. 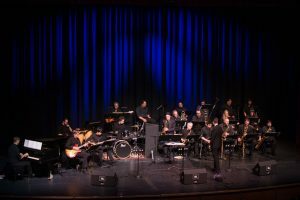 Zack Bruno, the director, sent out some pictures yesterday from our May concert. This is the one I was pretty steamed at the other guitar player for playing on every number when he was supposed to take turns with me. Since I’m playing here, he should be just watching . . . but he isn’t. I’ll get over it someday. Actually I was over it until I saw these pictures. Here’s a picture of the whole band from the same concert. This semester I’m playing bass at Zack’s request. There’s really no option for multiple bass players. So far the three of us have all taken turns nicely. Tom Kent came down to my house over the weekend. He’s going all around pimping his new CD to radio stations and club owners. Not so incidentally, he’s playing his music for more people than ever. Yesterday we went to the San Gregorio General Store to see Jay Howlett and Rolfe Wyer play. Actually, Tom had an agreement with Jay to let him play a few of his own songs plus he got to sit in and play some solos with Jay and Rolfe. It all went really well. I hadn’t seen Jay for quite a while even though he lives in Pacifica. We go back to our freshman year in high school and did some catching up yesterday. Rolfe and Jay both encouraged me to return any time and sit in. They play there the last Sunday of each month so I’ve got that in my calendar now. I would try to learn some of Jay’s songs except he has so many and he follows the Grateful Dead mode of playing what seems right at the moment. Tom did great just listening and filling in so I should be able to do something similar. He’s got self confidence where I have fears, tho’. Another thing to work on. Saturday night, Tom played me a demo of one of his new songs and we had some good conversation working on ways to improve it. Not really germane to the story of this weekend, but about my music, is that tonight is the Skyline jazz band rehearsal. Zack (Bruno, the director) has chosen a couple of tunes that feature guitar. There is another guitarist but his skill level is similar to mine so we both are going to have to step up and play some exposed parts. I’m trying to practice more . . .